An Egyptian criminal court in the eastern city of Ismailia sentenced a police officer on Tuesday to eight years in prison for beating a man to death in custody and falsifying police records, Reuters reports. 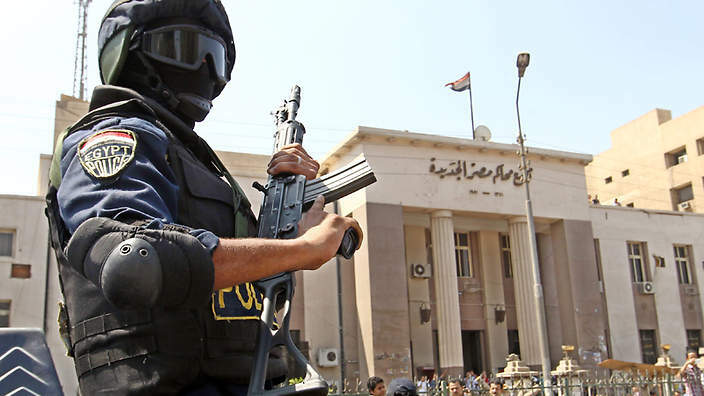 The policeman, Mohamed Ibrahim, was sentenced to five years for “torture and beating leading to death” and three years for falsifying police records in connection to the case. The victim was a middle-aged veterinarian by the name of Afify Hassan whom the sentenced police officer beat to death after hauling him from his wife’s pharmacy on 25 November last year. The incident was one of three separate cases of deaths in custody in the space of a single week in November, sparking riots in Ismailia and the southern city of Luxor, where nine police officers are facing trial for beating a father of four to death. Human rights groups claim that police brutality and torture are rampant in Egypt. In Human Rights Watch’s annual World Report of 2016, the organization maintains that despite the presence of documentation of police brutality, few cases reach the courts. And if they do, they are often appealed and the sentences are reduced. On its part, Amnesty International has documented an increase in cases of torture, deaths in custody, and enforced disappearances across Egypt since the appointment of Magdy Abdel Ghaffar, who has a background in the security sector, as Minister of Interior in March 2015. The sentencing of the police officer comes as the international spotlight is focused on Egypt following the death of 28-year-old Italian doctoral student Guilio Regeni, whose tortured body was found in a ditch in Cairo on 3 February. Italian authorities have demanded a thorough investigation be carried out in order to bring the responsible to justice. Despite allegations that the notorious security services was involved in the death of Regeni, the Egyptian government forcefully rejects this.